1. Prepare rice according to package directions. Keep warm. 2. Heat the butter in a 10- inch skillet over medium-high heat. Add the chicken and cook until well browned, stirring often. 3. Stir the broccoli, soup and milk in the skillet. Reduce the heat to low. Cover and cook for 5 minutes or until the chicken is cooked through. 4. Serve over rice and sprinkle with the cheese. 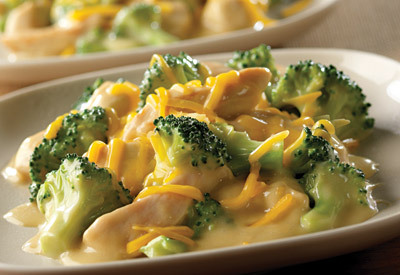 Try this recipe with Campbell's Condensed Cream of Mushroom Soup and shredded Swiss cheese.